It seems as if everyone is angry these days, with conservatives disgusted by the tactics the liberal media and Democrat politicians by attempting to assassination the character of Justice Kavanaugh, in an attempt to prevent his confirmation to the Supreme Court, and liberals angry and vowing a "day of reckoning" for Republicans that supported him, but frankly Kavanaugh is simply the latest casualty in a nearly two-year long liberal temper tantrum over the election of Donald Trump as President of the United States of America. In no way, shape or form, am I claiming that conservatives do not get angry, feel enraged, but we do not see conservative protests where rioting is the expected result, or where violence and death threats against Democrats or liberals are acceptable or condoned by conservatives as a whole, nor excused in an attempt to justify violence and threats against anyone with a different political ideology. What we have witnessed over the past few weeks is nothing short of dangerous and people need to understand that Democrats have become the party of rage. This week it was Justice Kavanaugh, next week it will be something else, and over the previous nearly two years we have observed with each new outrage, the death threats against conservatives increase, the protests become more violent, the liberal anger and rage is growing exponentially. For example..... does anyone remember conservatives threatening the lives of Democrat politicians and other liberals when Barack Obama nominated and the Senate confirmed Sonia Sotomayor or Elena Kagan? Did conservatives unhappy with those choices march up to the Supreme Court doors, with crazed people literally trying to claw at a locked door, with others screaming, pounding and chanting? Nope. Look at the scene outside the Supreme Court on Saturday as Brett Kavanaugh was sworn in as Justice Kavanaugh. 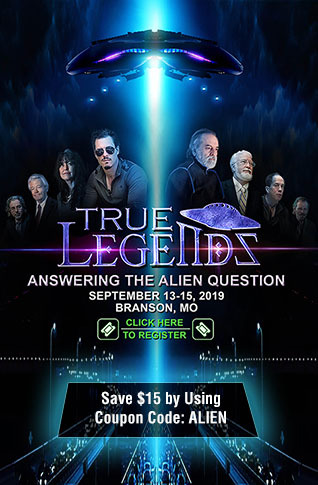 That is just not normal behavior, it is a scary freak show, yet it has become the norm for liberals that have been incited to near insanity by the establishment media. Conservatives are not the only people highlighting the large part the media has played in dividing the nation, as CNN and the liberal MSM were recently called out by CNN's former bureau chief Frank Sesno, who accurately accused the media these days of "unrelentingly negative" coverage of President Trump. Back to the point, what I am highlighting is the difference in the actions of liberal protesters during the Kavanaugh confirmation, to the actions by conservative counter protesters. Another example: In the midst of the liberal chants and protesters during last week's circus before the final Kavanaugh vote, an elderly conservative man, (we know he is conservative because of his signs) was quietly standing with his hands in the air holding signs, showing support for Kavanaugh, both signs had messages on both sides. 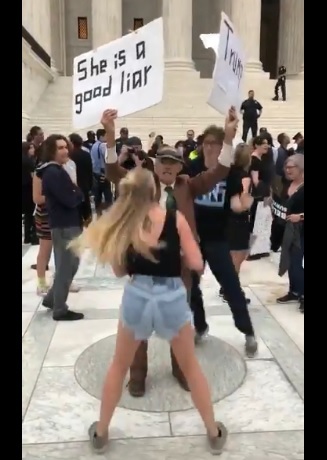 Two younger Kavanaugh protesters started hopping around him, yelling chants in his face, before the female assaulted him by trying to knock his signs out of his hands. We have already written about the unbelievable amount of death threats Republican Senators are receiving, to the point where Senator Rand Paul's wife wrote an op-ed explaining she now sleeps with a loaded gun by her bed, and others have been threatening the life of Justice Kavanaugh, and not just "random" liberals venting on social media, but in one case a special education teacher tweeted ""So whose gonna take one for the team and kill Kavanaugh?" The tweet was deleted, but not before others saved it, and the Alliance Education Center in Rosemount issued a statement that they were made aware of the situation and the teacher has been put on administrative leave pending investigation, and the FBI in Minneapolis has confirmed it has been made aware of the threat. 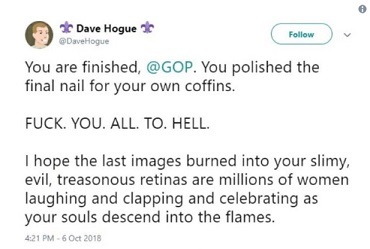 Another not-so-random user at Twitter, David Hogue, described on his LinkedIn page as "UX Leadership at Google," meaning a lead designer, also deleted his temper tantrum from Twitter, again, not before other users caught a screen shot, threatening the GOP, calling them slimy, evil, and treasonous, telling them to "F**K. YOU. ALL. TO. HELL." After the Kavanaugh confirmation vote on Saturday, Republican Senator Cory Gardner's wife received a "graphic text message with a video depicting a beheading, and that someone has publicly posted the names and addresses of his family members," as reported by Fox News. Representative Steve Scalise, a congressman that was critically wounded in July 2017 when a liberal unhinged lunatic opened fire at the GOP congressional baseball practice, shared that Fox News story, calling on Democrats to denounce these types of threats, stating "These vicious threats have to stop. This cannot be the new normal—there is absolutely no place for violence in our political discourse. Democratic leaders need to denounce this behavior." The response from Martin Cizmar, the senior editor for the liberal news website Raw Story, was "Boo boo little baby." In the back and forth in the thread of that response, many were taking him to task for his comment to Scalise, yet who jumped in to defend him, another Raw Story employee, who proudly touts in his profile that he is a member of the @news_guild, which is a union for digital & print journalists and all media workers in North America. My point here is this is not fringe behavior as other liberals are not condemning it, as I have seen conservatives condemn abhorrent behavior from other conservatives, instead they are excusing this type of political discourse as justified, or ignoring it completely. This blind hatred, hostility, threats, and intimidation tactics, which are leading to more threats and violence after the initial intimidation failed to result in the outcome liberals wanted, has become the normal behavior of the Democrat party. At the beginning of this article I said it appears that everyone is angry these days, and I am noting on social media, chat forums, and comment sections across the Internet, conservatives "anger" is not manifesting in the same violence or intimidation tactics as the liberals display, it is burning much colder, as conservatives are energized by watching the violent radical libs, preparing to vote, to stand up against the tactics of the left, but most importantly, I am noting they are preparing to defend themselves, their families and their communities.